Day 4 was the day I was most apprehensive about, the one day where I really wanted to challenge myself to do something different. Day 4 was all about seeing and touching a great white shark! We were all up early and Johann (Moto Motivo) was motivating everyone to get ready for the days ride as he had many sights and activities planned for us. 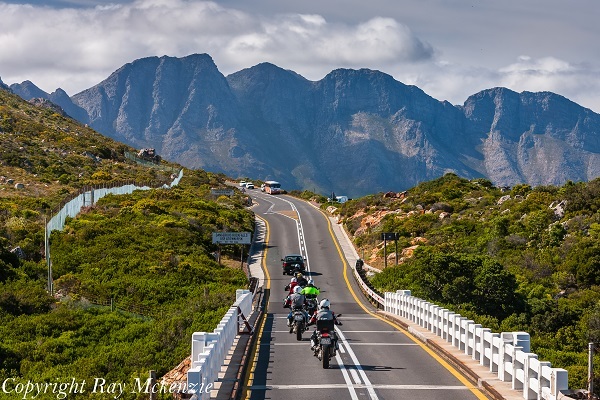 It was not long before we were on the amazingly beautiful R44 coastal highway south from Gordons Bay enroute to Klienmond. This stunning stretch of road follows the rugged coastline with near perfect asphalt and on the day we drove it very little traffic! 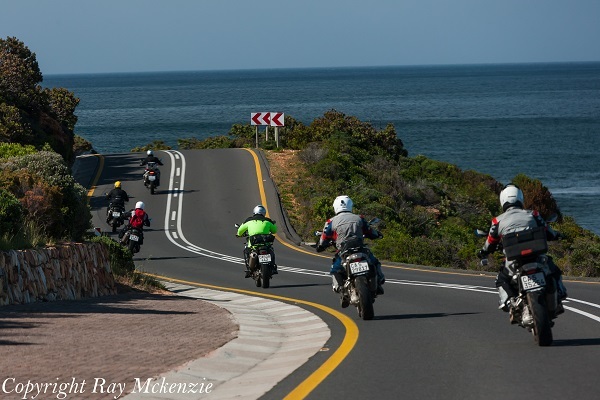 The motorcycles were in their element, and they were out of our sight after the first series of corners! Dr Don did his best to stay with them, but there was no way a loaded support truck hauling a trailer was going to keep up with them on the undulating windy road! 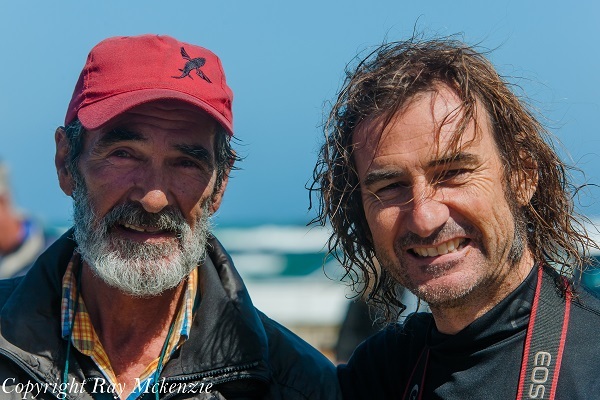 We stopped in Klienmond to have a quick breakfast and java, and I took the opportunity to run (literally) down to the ocean to try and get some shots of huge waves crashing against the rocks! The wind was pretty stout and the ocean spray was being carried well inland, creating such a beautiful sight! I clambered over rocks and eventually found a location to grab some quick photographs! The sight and sound of the waves breaking was so amazing, I could have stayed there for hours! I noticed that Anthony had also come down to grab some photos, and it was so cool to watch him frame a scene, and then see the end outcome in his photo. Anthony has a very artistic and unique shooting style which is easily recognizable, and I enjoyed taking a few moments so we could shoot the same area from our own points of view! With breakfast warming our insides everyone was ready the long day’s drive and Johann led us further along the coast to incredible Van Dyks Bay. 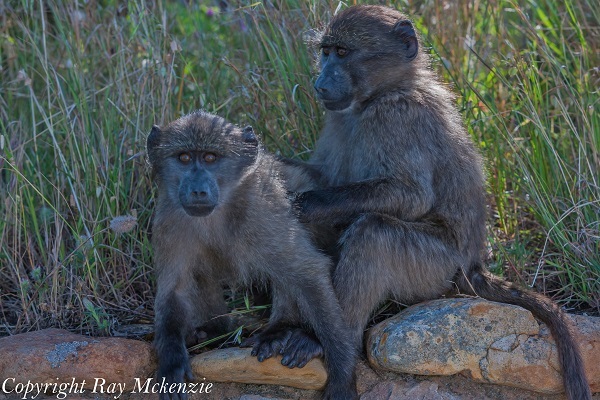 The coastal highway surprised us with more amazing views, but a group of baboons playing along the side of the road captured my heart! Two baby baboons literally play fighting across the road in front of us and then up onto a wall right beside the truck! I was only a few feet away from them shooting away as they posed for a few seconds, looking right at me, and then they were gone play fighting with each other down the road behind us! What an awesome experience! As we pulled into Van Dyks Bay I could feel my excitement building, the signs for great white cage dive excursions were everywhere! Johann took us to every excursion office in the town, and it was clear to me that we were just a little too late to do any cage diving with the great white sharks. I was so disappointed, and there is no doubt Johann could see it in my face. 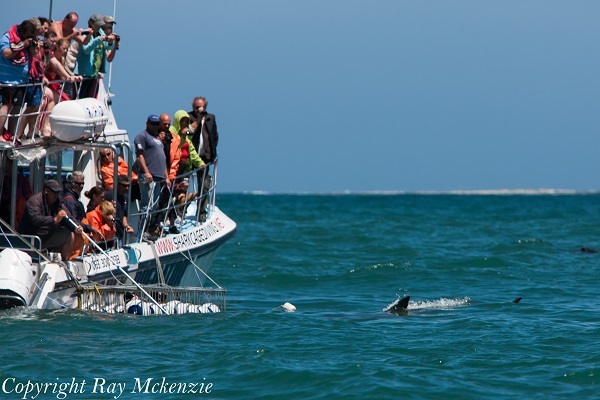 Never the less, he found a guide company that would take us out to seal island and perhaps we would see a great white shark from the surface while hunting the seals. 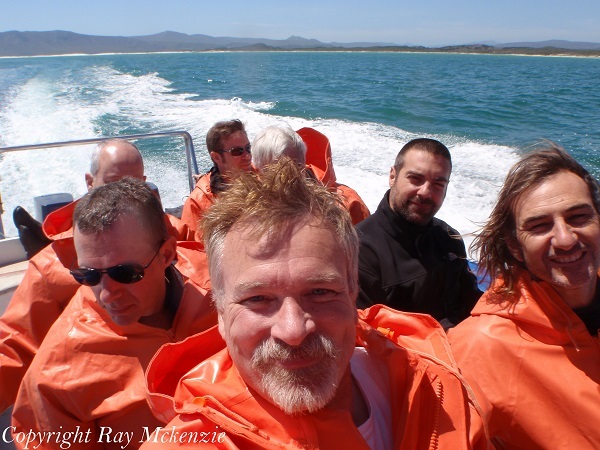 Every single person from our group signed up for the boat ride and it was not long before we donned our waterproof gear provided by the excursion company and loaded into the zodiac. Our boat Captain was right out of a movie, a thin bearded man with tanned rough skin, and piercing grey eyes, a truly interesting character! Our captain powered the zodiac through the 6 foot waves 7 kilometers out to seal island, officially known as the Dyer Island Reserve. The ride out was entertaining, with waves crashing over us, and the boat catching air and then landing with a crash! I had all of my camera gear wrapped in plastic and held it under my rain slicker, but I did manage to take some pictures with a small waterproof point and shoot! Anthony had his GoPro Hero3 out taking video and photos of our journey through the rough water! It was a roller coaster ride which had everyone holding on to anything solid! We stopped briefly near some shark cage diving excursions and saw a great white from a distance as it thrashed around the cages lashed to the side of the boat. Cool, but just not the same as it would have been being down and seeing the great white shark up close and personal! 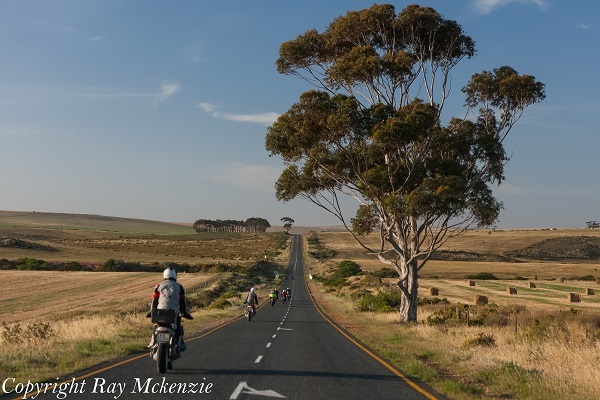 Just another reason to come back to amazing South Africa! We could smell seal island before we got there, after all there are 40 to 60 thousand seals there lounging on the rocks and feeding in the shallow waters, and always weary of encounters with the great white sharks that hunt them! Many of the seals had fresh bite marks, evidence that not all encounters with a shark end badly for the seal. 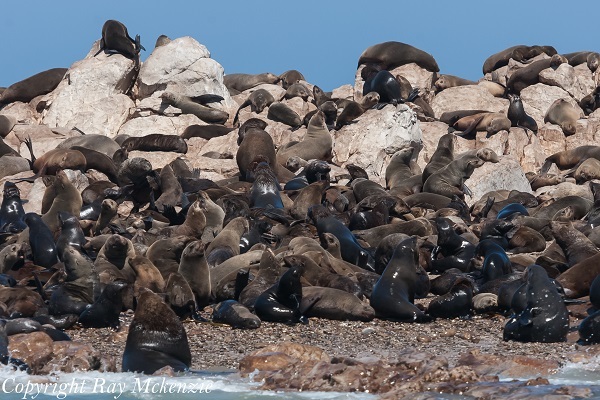 It was an amazing sight to see so many seals crammed into the water, sandy beaches and rocks, everywhere you looked there were seals! 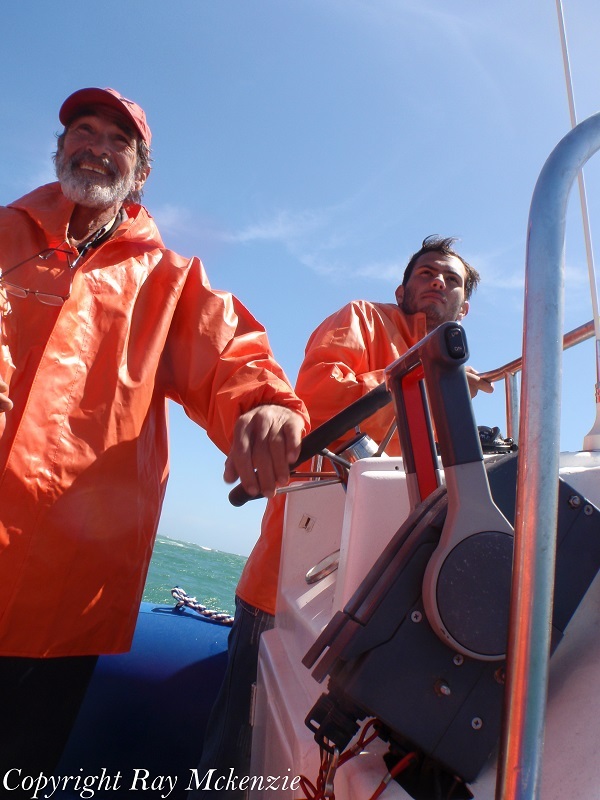 The wind steadily increased and so did the wave size so our captain turned us about and headed back to the shelter of Van Dyks Bay. 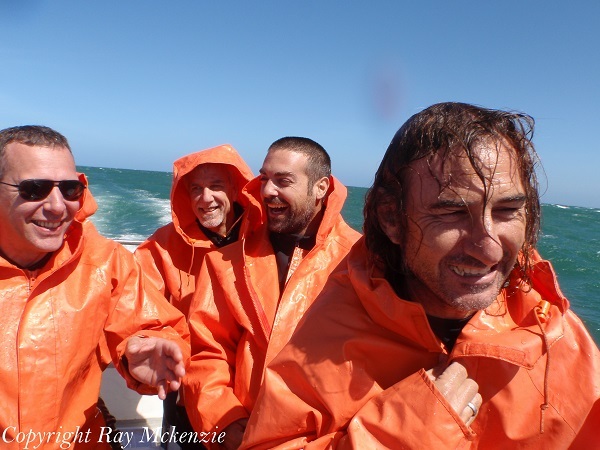 During the trip back the waves where huge, easily 8 feet or more and at one point Neale proclaimed “it looks like it is getting calmer” and a few seconds later a huge wave came over the bow of the zodiac engulfing the boat and soaking everyone! I was lucky as I was facing backward with my hood over my head, everyone else was soaked head to toe! I knew it was a big wave when I felt shade in the middle of the ocean just before the wave crashed over us! LOL We all laughed at being soaked and I think we were happy once we reached dry land! We thanked our guides for the experience and were on the road in minutes! Johann had found a nice dirt road for everyone to ride, taking a route through the pastures and farmland! Once we hit the dirt so to speak the guys on the bikes disappeared ahead of us in a cloud of dust, leaving Dr Don and I to enjoy the countryside on our own! 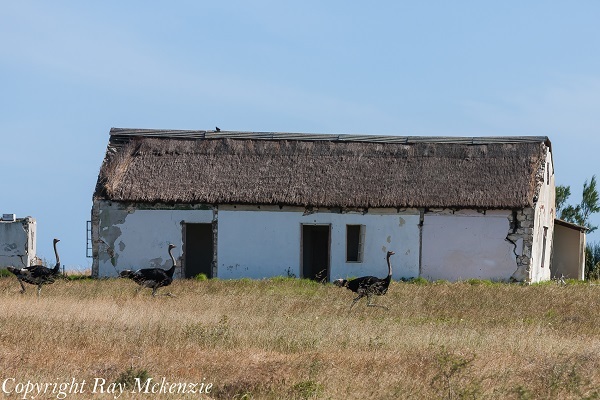 We could not resist stopping momentarily on occasion to take some pictures of ostriches running in the fields, and buildings along our route. I was surprised at how HUGE the ostriches were and how fast they are when on the move! It was incredible to see them in person and in their natural habitat! 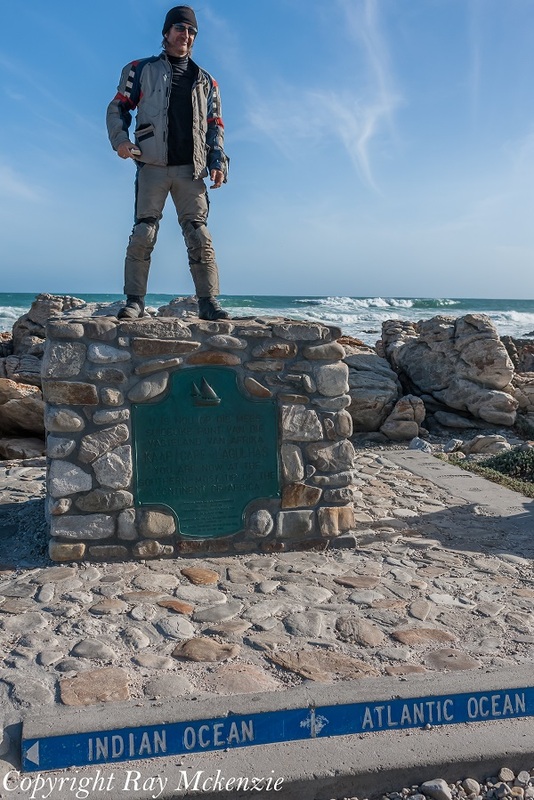 We caught up to the group about 80 kilometers later, and made our way to Cape Agulhas, the point where the Atlantic and Indian Oceans meet! 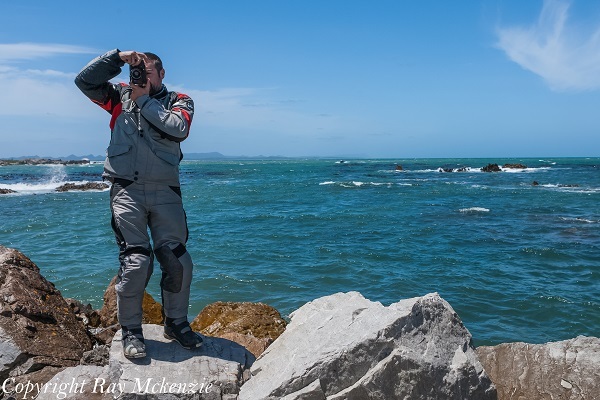 The nearby lighthouse and landmark gave us backdrops for typical tourist group shots, as well as some more creative shots of Neale and Anthony on the beach near some rocks. 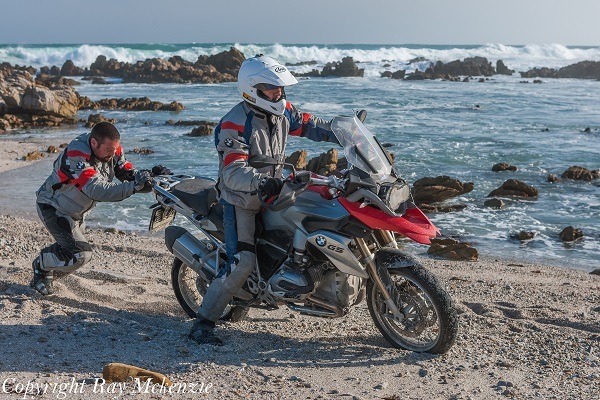 Both Neal and Anthony drove their motorcycles down onto the sand/rock beach with no problem, however getting both motorcycles back up the incline to the road required some pushing and lots of throttle! 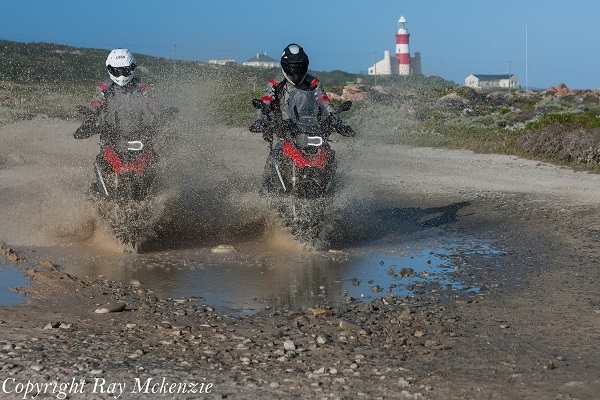 Not finished with creative motorcycle play they also drove through some big puddles of water, making their own splash on South Africa, seeing who could make the biggest wave! It was clear that both Neale and Anthony trust each other’s motorcycle skills enough that they rode through the water side by side, something you just do not see often, making a huge splash only inches apart! 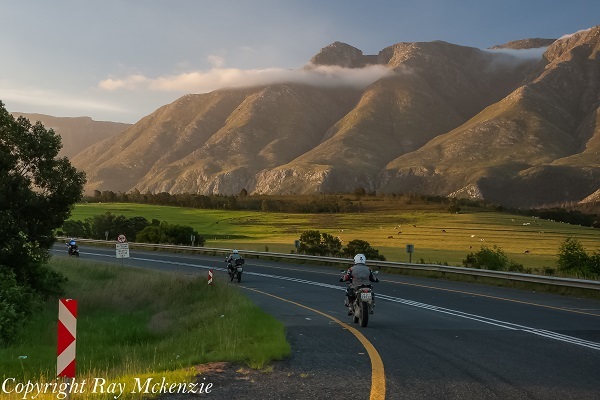 The last leg of the day took us inland to Swellendam, and with the sun getting low in the sky lighting the scenery in an amazing evening glow. Neale lagged behind and I recognized a great photo opportunity! I was literally hanging out the window of the truck shooting back towards Neale (he was backlit) and I noticed the shadows on his bike being illuminated by something! 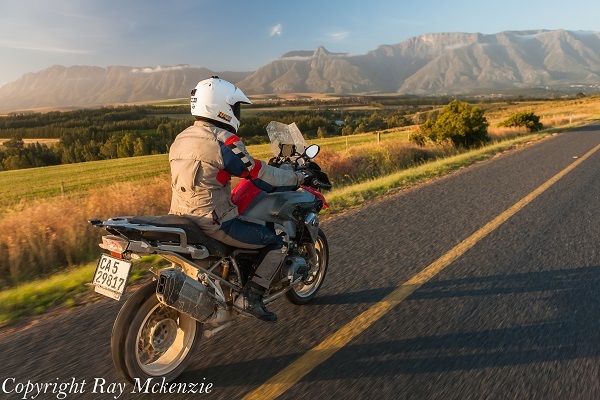 I knew immediately that the setting sun was reflecting off the truck and onto Neale, so I yelled to Dr Don to slow down so I could shoot Neale on his BMW R1200GS from a rear quarter view! It was the magic hour in terms of lighting so I was happy that Neale made it easy to capture some amazing shots! The shots from this moment are my favourites of the entire trip! 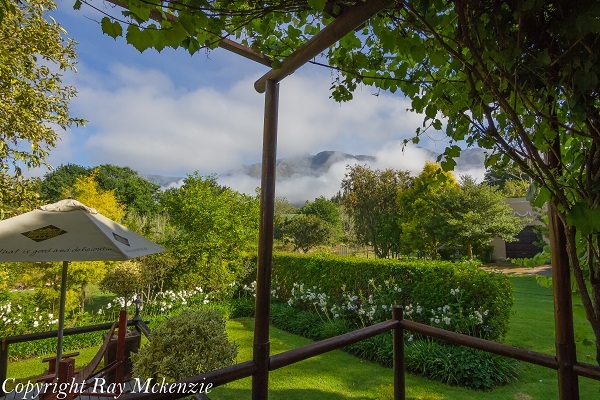 Our hotel for the night was an amazing bed and breakfast, the Aan De Oever guest house in Swellendam. Again Johann had outdone himself, this bed and breakfast had amazing mountain views, large comfortable rooms, and incredible service. I walked the grounds absorbing what amazing scenery and things that we had done on this day, incredible South Africa had truly captured my heart! Outstanding images. I only wish you would have been on the second trip with us. It would have been a pleasure meeting you in person. Thanks for sharing these great images.